Buy the CD here, and the MP3s on iTunes! 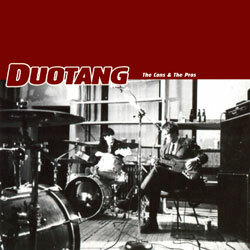 Two whole years after the release of their debut album, Duotang create another pop masterpiece in The Cons And The Pros. Rod Slaughter and Sean Allum rip into the album on a loud note with the bouncey and crisp "Call Your Side" and the swirling heights of "The Hedonists Collide". Throughout the twelve tracks the album moves swiftly from the detonating pop of first single "Broken Rule" to the articulate depths of "Leave Well Enough Alone" and back into the brassy mod-pop of title track "The Cons & The Pros". Recorded at Toronto's Electromagnetic Sound and Winnipeg's Private Ear, The Cons & The Pros was produced by Brenndan McGuire, responsible for other pop-tones from Sloan, Jale, and the Superfriendz. Few bands are able to bottle the intensity of their stage show onto tape, but with the added help of a brass section, organ, and a multiplicity of layered vocal harmonies, McGuire and Duotang have managed to turn two rhythm instruments and a voice into an orchestral exercise in recorded energy.